Most of the typical houseplants sold in garden centers are actually tropical plants. Tropical plants make excellent houseplants because they are very easy plants to grow inside, and most of them have the same basic needs. That’s great new for us, and it makes tropical houseplant care much easier! 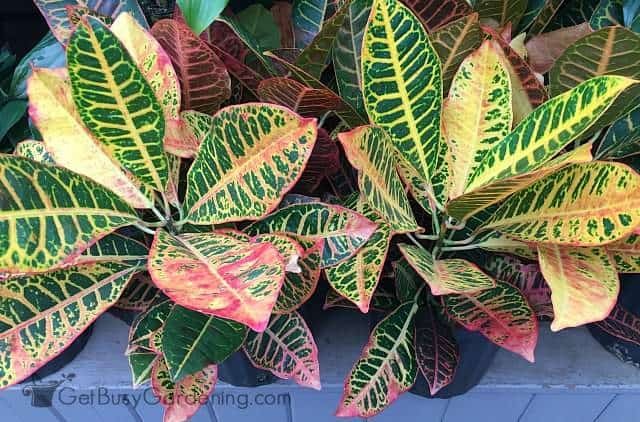 When you go shopping for new houseplant varieties, you might notice that most garden centers carry a lot of the same types of indoor tropical houseplants. Well, the reason for that is because those are the types of tropical plants are easy to grow indoor houseplants. Tropical plants make excellent houseplants because many of them can easily adapt to growing indoors. 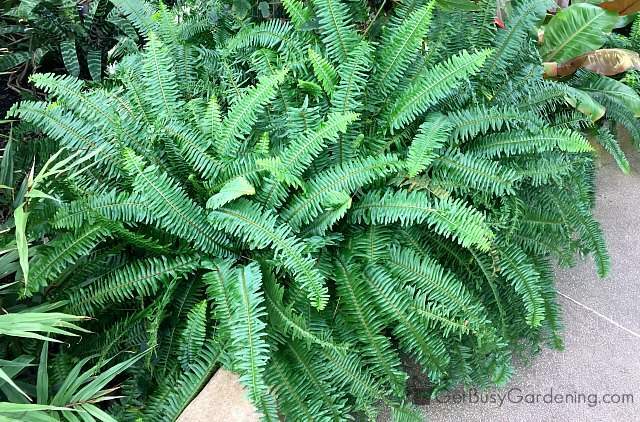 Many of these plants come from tropical forests where they live under the shade of large trees. That means they don’t need a lot of light, which is perfect since most of us don’t have a lot of sun in our homes anyway. 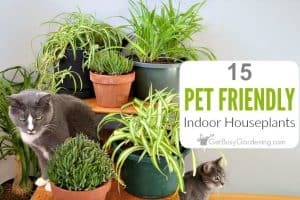 Plus, the reason they’re the most popular indoor plants is that most of these exotic indoor plants don’t require a ton of special care. That makes keeping them alive so much easier! There are hundreds (probably even thousands) of different types of tropical plants for indoors, so there’s no way I could come close to naming them all here (besides, who would want to read all of that anyway?). 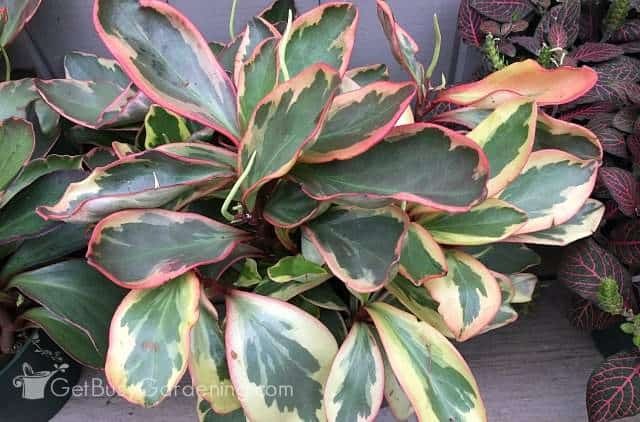 So, I’ve put together a list of some of the best and most common indoor houseplants found for sale at garden centers. 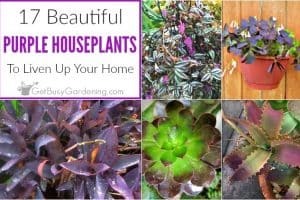 These easy houseplants are my top picks for the best plants to grow indoors, and also some of my personal favorites. Like I mentioned above, most popular tropical houseplants have similar growing requirements. That’s awesome for us, and it makes tropical houseplant care so much easier! 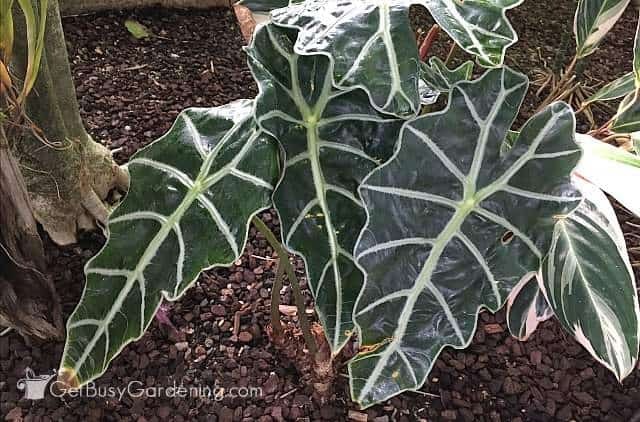 Of course, every plant is different so it’s best to look up the exact type of tropical plant you’re growing to make sure it doesn’t have any special care instructions. But below are some general guidelines for how to take care of tropical plants. Most tropical plants like their soil to stay evenly moist, but not wet. This can be tricky to get just right. Many common houseplants will tolerate being under watered once and a while, but overwatering is the number one cause of death for tropical indoor plants. So, try not to allow either extreme to happen. Check the soil regularly, and only water houseplants if they need it. To see if a plant needs water, stick your finger down about an inch into the soil. If the soil feels wet, then it doesn’t need to be watered. Indoor plant watering devices can help to make watering tropical plants easier, especially if you tend to forget to water your plants. If you struggle with watering houseplants correctly, I highly recommend using a soil moisture gauge so you know how often to water tropical plants. Humidity can be another big factor when it comes to tropical houseplant care. Tropical plants like it humid, which makes sense if you think about where they come from (the humid tropics). The good news is that most common tropical houseplants will easily adapt to living indoors where the air isn’t usually very humid. Some plants are more sensitive to it than others though, and it never hurts to add more humidity to the air when it’s dry. 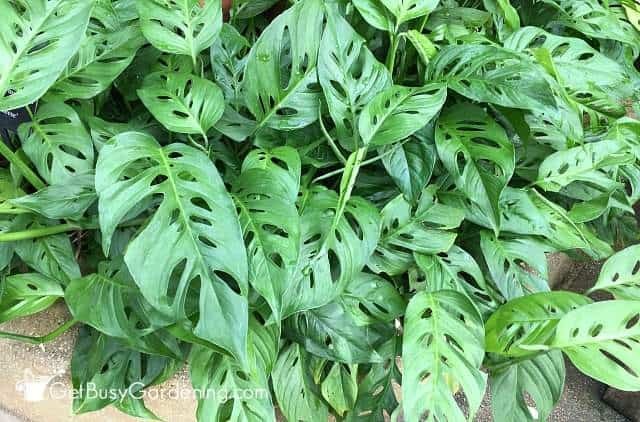 There are several things you can do to help increase the humidity level around your tropical houseplants. You can run a humidifier near them, or mist them on a regular basis using a plant mister. You could try putting your plants on top of pebble trays filled with water (don’t allow the plant to sit in the water though). Growing small plants under a decorative plant cloche, or putting a bunch of them into a mini indoor greenhouse also works great to give them plenty of humidity. Put an indoor humidity monitor near your tropical plants to keep an eye on the humidity level. 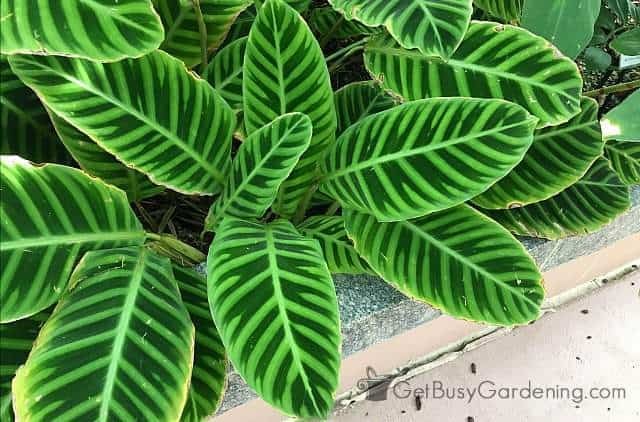 There are many types of tropical houseplants that adapt well to the low light conditions indoors… but there are some that need bright light to grow their best. Again, it’s best to look up the specific type of plant you have so you know for sure. If you put a plant that prefers low light in a sunny window, it can burn their leaves and could kill the plant. 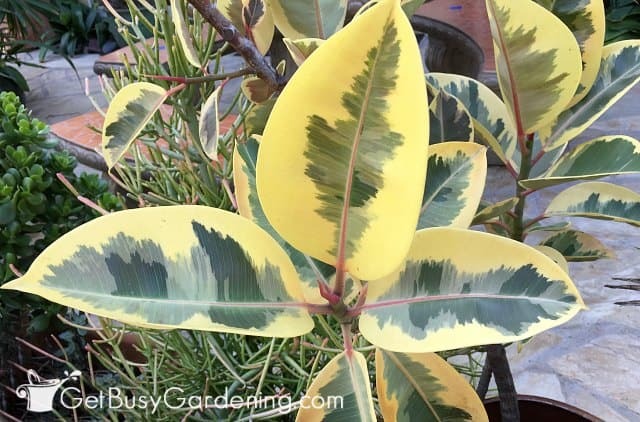 On the other hand, if you try growing houseplants like croton, rubber tree, and some varieties of dracenas without much light, they will start to lose their color and grow long and leggy. So, if any of your tropical plants have started to grow leggy and are reaching for the window, or they have lost their color, that means they need more light. Move the plant to a sunnier spot, or add indoor plant lights. On the other hand, if you are growing plants indoors in a sunny window and the leaves start to burn, then move them to an area where they’re protected from the hot sun. When it comes to soil, most indoor tropical houseplants aren’t super picky, they will grow just fine in a general purpose potting soil. 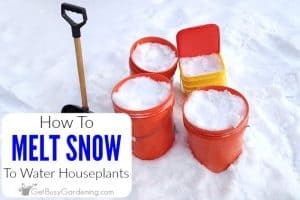 If you usually end up overwatering plants, then I would recommend adding extra perlite or pumice into the potting soil so that the water will drain out faster. On the other hand, if you often forget to water your plants, then you can mix some peat moss and/or vermiculite into the general purpose soil before potting plants to help retain moisture longer. 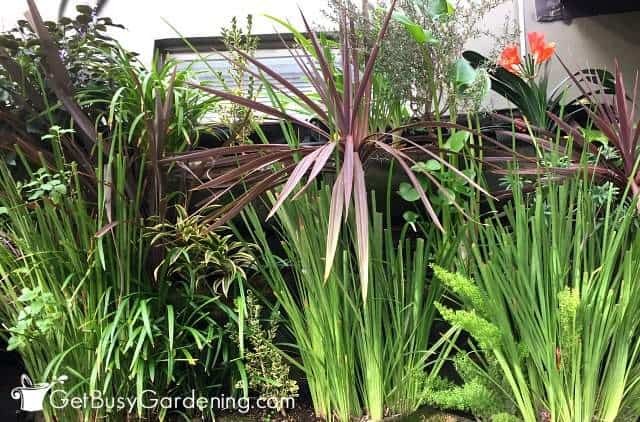 Some exotic plants do require special soil though (bromeliads and orchids for example), so be sure to do a bit of research for the types of indoor plants you’re growing before repotting them. Feeding indoor plants is beneficial during the spring and summer, so be sure to make it a regular part of your tropical houseplant care routine during those months. Don’t fertilize tropical plants during the winter months unless you’re growing a plant that requires it. I recommend using organic plant fertilizer on tropical plants because many of them are sensitive to chemical fertilizers, and can burn easily. You can buy a tropical plant fertilizer, or use a general purpose fertilizer for indoor plants. A general purpose compost fertilizer is also a great choice. Use a pre-made compost liquid fertilizer, or you can buy compost tea bags and brew your own. Slow-release granular fertilizer would also work great. Houseplant pests can be a major pain, and dealing with them is no fun. The best thing you can do is keep your tropical plants healthy and thriving, because healthy houseplants don’t usually have insect pest issues. But, inevitably, if you grow houseplants indoors, you’ll probably have to deal with pests at some point. Spider mites and soil gnats are two of the most common types of houseplant pests, and they love tropical plants. If you find that a plant has bugs, begin treatment immediately. Don’t use chemical pesticides though, they aren’t very effective on these types of bugs (plus they’re harmful to us and our pets!). I recommend using organic neem oil, which is a natural pesticide and works very well for getting rid of houseplant bugs. I also like to use a mixture of 1 tsp mild liquid soap per 1 liter of water to kill bugs on contact. Insecticidal soap or horticultural oil also work great for organic pest control on houseplants. Yellow sticky traps or houseplant sticky stakes work great to help get rid of flying houseplant pests like fungus gnats. Learn more about how to get rid of houseplant bugs here. Just because tropical plants are often referred to easy indoor plants to grow, it doesn’t mean you won’t have any problems caring for them. Tropical houseplant care can be challenging, especially for some of the fussier types of houseplants. Below are some common problems you might have, and how to fix them. Dull leaf color – When brightly colored plants start to fade and look dull, that’s usually caused by a lack of light. Dull leaf color is easily fixed by simply moving the plant to a brighter location, or adding a grow light. See the section above for more information about recommended lighting. Brown or yellow leaves – Brown or yellow leaves are common problems for tropical houseplants, and are usually caused by lack of humidity, or improperly watering indoor plants. 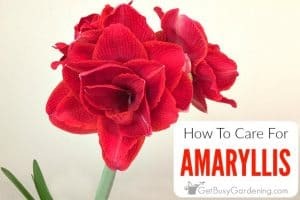 See both the section about how to water plants, and the humidity section above for details on how to fix those issues. Weak, leggy growth – Weak or leggy growth is usually a sign that the plant isn’t getting enough light. Plants that aren’t getting enough light will reach for the nearest light source, so you may notice your plant is starting to lean to one side as well. Move the plant closer to a sunny window or add a grow light. See the lighting requirements section above for more details. Leaves drooping – If a houseplant suddenly starts to droop or sag, that usually means it’s either being over watered or it isn’t getting enough water. Check the moisture level by sticking your finger one inch into the soil. If it’s wet, then allow the soil to dry out before watering again. If the soil is dry, then give the plant a good drink of water. I recommend getting a soil moisture gauge to help make watering a snap. See the section above to learn how to keep your houseplant perfectly watered. Many of these common houseplant problems could also be caused by pests like spider mites, so be sure to inspect the plant for signs of infestation. See the section above about dealing with houseplant bugs for more details. If you’re wondering where to get indoor plants, you should be able to find tropical houseplants for sale at your local garden center. Although keep in mind that it’s much easier to find indoor plants for sale during the fall and winter months than it is during the gardening season, so you may have to be patient. You can always buy houseplants online, where you can find tropical plants for sale year-round like this cute collection of mini tropical plants or a mini fern collection to get you started. There are tons of cool and unique tropical plants that make beautiful indoor plants. 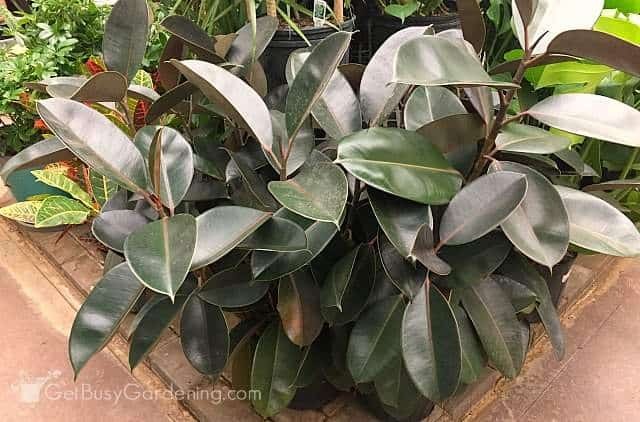 The top houseplants sold in garden centers are easy to grow indoor plants, and have the same basic tropical houseplant care requirements. Tropical plants are awesome, and it’s fun to collect them (I know I have quite the collection myself!). 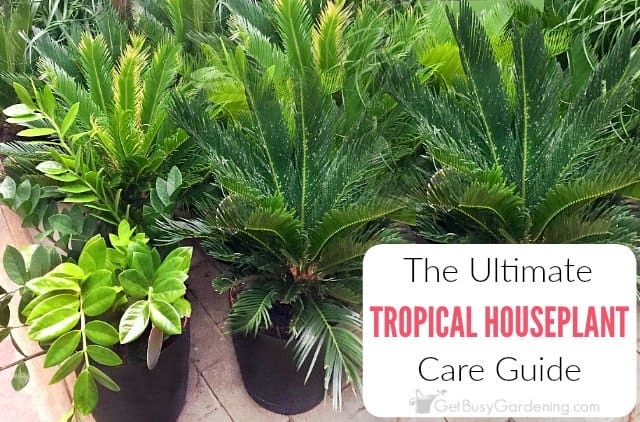 They’re definitely some of the best indoor potted plants to grow, and who doesn’t love to add a little bit of the tropics into their home with some exotic houseplants? Winter is the hardest time of the year to keep houseplants alive! 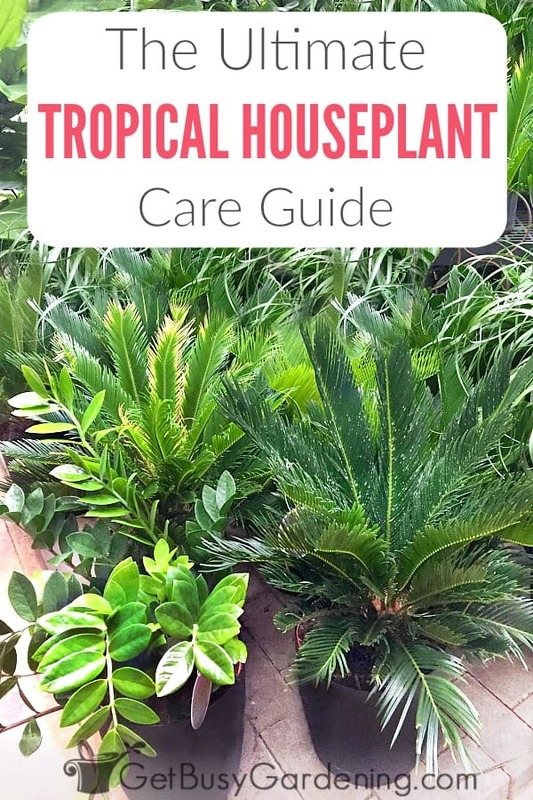 If you struggle with indoor plant maintenance during the long, dark and dry winter months, then my Winter Houseplant Care eBook is perfect for you! This comprehensive houseplant care guide will show you how to not only keep your houseplants alive, but keep them thriving all year long. Buy your copy today! Do you have anything to add about how to care for tropical plants? Share your tropical houseplant care tips in the comments section below.